Ford’s Shelby GT350 Mustang throws a left hook at the BMW M4 – will it land the punch or miss the mark when it launches in 2015? It’s a rare event that I get excited for a new car launch. The vast majority of cars are unremarkable, and the select few that are mouth-wateringly desirable are tongue-biting expensive. It’s a real humdinger then, when a car launches in the glow of perfection. Every detail having been honed and perfected, your eyes and ears are left with nothing but captive adoration. Those chrome air vents that reflected sunlight in your eyes: deleted. The void between the rear wheels where a limited–slip diff should sit: filled. Of course, no car is perfect, but a few come very close to perfection. The Porsche 911 (GT3, above all), BMW M5, Ariel Atom, Rolls-Royce Ghost, Jaguar F-Type, Ford Fiesta ST – they’re all cars that strike at perfection in their unique corners of the market and at various price points; they’re all cars that constitute more than the sum of their parts, cars that are animated, characterful and – dare I say – magical. They’re cars that allow you to overlook the few misgivings they have because the package is otherwise truly excellent and intoxicatingly rewarding to drive. This brings us to the launch of the Shelby GT350. Nobody saw this coming – not to this degree of excellence. The original GT350 was Carroll Shelby’s first kick at the street-legal high(er) volume performance car can. Shelby’s mandate with the GT350 was clear from the beginning, but the lump of clay that Ford continually handed him was, well… lumpy. Even Shelby – an accomplished racer and designer – couldn’t quite shape the Mustang into a full-on world-class competitor on the same stage as BMW, Porsche, Ferrari, Lotus and other admittedly more expensive sports cars. Fast-forward to 2011 and the GT350 nameplate was resurrected after a 40-year hiatus – but ultimately amounted to a bolt-on parts job by a tired Shelby garage that had yet another mediocre sports car platform to start with (can you say “wagon-axle?”). The 2015 Shelby GT350 project is different. It’s a Ford job, headed up by the best engineers the company has on offer. 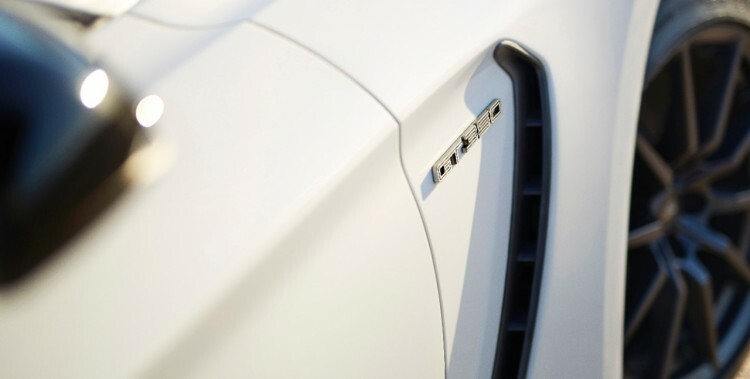 It’s more than a project – it’s clearly a love-child, not unlike the BMW 1M, Jaguar XJ220, or the first generation Z3-based M Coupe “clown-shoe.” I suspect many designers and engineers stayed up stewing over the car as late as I lay in bed pondering just how high its flat-plane crankshaft will spin (more on that later). 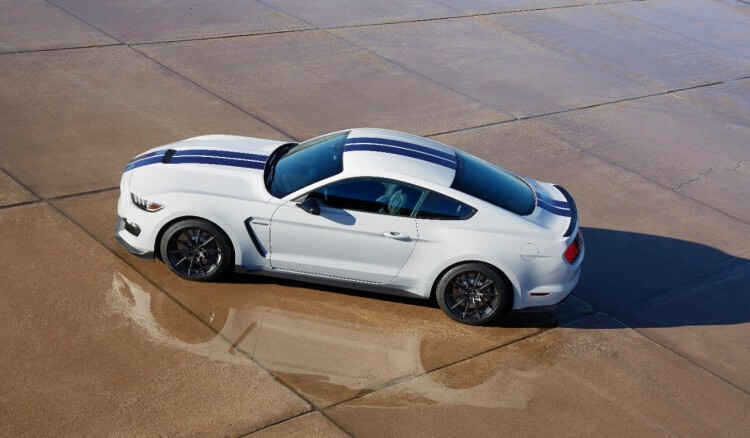 In a word, the new GT350 is ambitious. Like a few of the world’s best, the Ford Mustang has been developed over many generations. Now in its sixth iteration, and in the form of a specialty performance model, the Mustang has arrived. Thing is, it started off so far behind its European competition that any comparison was laughable, if not disheartening. I wanted to like it – I truly did, but I just couldn’t get past the live rear axle. It so annoyed my brain that the Mustang was easily dispatched as a wannabe sports car that was outclassed even by energetic sedans. Then there was the second (or third) class interior that squeaked, looked frumpy, and felt like a McDonalds Happy Meal toy. There was also that ‘Joe Dirt’ persona that followed the Mustang around like the party-end of a mullet – an image issue that was conjured by the loud minority of Mustang drivers that dressed and behaved in a fashion unbecoming of a gentleman. Thus, the Mustang never quite caught on in serious sports car circles – it was dismissed as second rate, and by the 5th generation, that was unfair. Okay, it still had that damn live rear axle, eager to toss the rear end wide over the smallest mid-corner bump, but that aside – it was a tremendous sports car. Ford even fixed the interior, stepping it up with quality materials on its last life cycle update. The magicians in Ford’s performance division poured a lot of special sauce into the Mustang Boss 302 Laguna Seca – a car notably quicker than BMW’s E92 M3 around California’s toasty Laguna Seca racetrack, and a new high-water mark for the brand’s under-dog sports car. I had the opportunity to unleash the Boss 302 at Ford’s development grounds in Michigan, and it was a drive I won’t soon forget. Even when I aimed for a ‘clean lap’ through the autocross, the 302 inevitably got a touch sideways – it really begs you to push harder. It was a genuine hoot to drive, sounded great, and put down some very fast runs. The Boss 302 is a car fast enough to give a few much more expensive sports cars a run for their money, and pecking order. You can take a look at a couple of my runs through the course with Ford’s Boss 302 below. Please excuse the poor audio and mid-video GoPro deliberation. 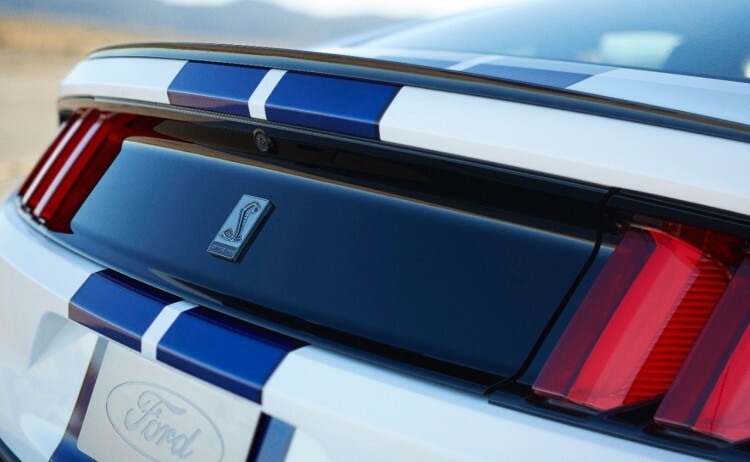 With the excellent Boss 302 as its kickoff point, Ford set out to create the new Shelby GT350 – a car spiritually dedicated to the racetrack like its original forbear. Unlike every other performance-enhanced Mustang before it, the GT350 has been designed as a harmonious whole – a purpose-built sports car engineered as a complete package – not a parts-bin after-thought. It’s a bespoke sports car. And it’s based on a well-sorted base package – the 2015 Ford Mustang GT. Ford has been mum on exact power figures, curb weight and pricing – but they’ve spilled enough beans to let us cook up a delicious, dreamy sports car stew. Let’s start with the engine, shall we? No doubt the biggest surprise in the GT350 is found under its aluminum hood. Ford decided to take the road less traveled and build an all-new power plant unique to the GT350. The only parts it shares with the Mustang GT’s 5.0 litre mill are ancillary – items such as the starter, alternator and a few valvetrain elements. The allure of this new engine lies not in some form of forced induction – but in its exotic flat-plane crankshaft design. Indeed, only a handful of exotic sports car companies build flat-crank V8s – Ferrari and Porsche among them. Ford has revealed that this new V8 will be the most powerful naturally aspirated engine ever produced by the brand. In other words, it’s lined up to pack more punch per liter than Dearborn’s latest supercar, the Ford GT. The technological benefits of the flat-crank design are numerous and significant. First of all, the 180-degree firing order of the engine allows for better breathing, as there is no overlap of exhaust pulses between cylinder banks. The improved breathing lends itself to higher maximal engine output and elevated performance across the entire rev-range with a healthy, flat torque curve. Second, a flat-plane crankshaft has no primary imbalance, meaning it can forego heavy balancing shafts and counter-balance weights. This makes the engine lighter, and allows it to rev substantially higher. It also allows it to spin up faster, just as adding a lighter flywheel would allow. We know the GT350 will redline above 8,000 rpm; a good guess is 8,200 sonorous, melodic rpm – but it could be higher. Consider that the angriest engines on offer by Ferrari and Porsche redline at 9,000 rpm, and it becomes clear that this Ford engine is very special indeed. Ford states that the GT350’s 5.2 litre naturally aspirated V8 will produce, “Over 500 horsepower” – a rather hefty figure. It will also pack more than 400 lb-ft of torque, channeled through a 6-speed manual transmission – with no automatic or dual-clutch on offer in a nod to purist performance drivers the world over. We’ll place our bets on 546 hp (105 hp/liter) and around 430 lb-ft of torque. Despite growing in displacement, the GT350’s engine is lighter than the Mustang GT’s 5.0 liter. The new Mustang GT sporting a 6-speed manual weighs 3,705 pounds (1,680 kg); for comparative purposes, that’s exactly 1 pound heavier than BMW’s E92 M3 coupe with a 6-speed manual. BMW have done an incredible job of lightening the M4, which tips the scales at 3,530-pounds (1,601 kg) when fitted with a manual – thus leaping into an entirely different weight class than its predecessor and the run-of-the-mill Mustang GT. We can expect the new GT350 to weigh less than the GT, as Ford has switched out the entire front body skin with aluminum panels – the bonnet and front wings are all made of the lightweight alloy – and has sought weight savings in other areas around the car. Don’t expect major weight loss to bring the GT350 toe-to-toe with the M4 (beefier performance parts add weight back onto the car) – we would place our bets on a curb weight in the neighborhood of 3,600-3,650 lbs (1,633-1655 kg). Ford has stuck with conventional iron rotors to bring this frenzied sports car to a halt, but they’ve pulled no punches in making this braking system the most aggressive they’ve ever produced. The PR folks have stated that the GT350’s brakes are, “the most track-credible ever offered on a Ford vehicle in terms of absolute stopping power, fade resistance and brake pedal feel.” The discs are cross-drilled, mounted on aluminum hubs, measuring 15.5 inches (394 millimeters) up front, and 15 inches (380 millimeters) at the rear. In terms of chassis dynamics, the GT350 starts with a very rigid base – the 2015 Mustang gains 28% more torsional rigidity than the 5th generation Mustang it replaces. A carbon-fiber strut-tower brace promises to further stiffen things up, allowing the new continuously adjustable dampers to do their job. The front track has been widened to enhance front-end grip – a move similar to Porsche’s widening of the 991’s front track. Finally we arrive at the aero package on the GT350, which firmly establishes this Mustang as a serious performance machine. To compensate for the widened front track of the car Ford has lowered the engine bonnet and wrapped it tightly around the engine, thus maintaining a similar frontal area. Reworked front fascia elements and a low-slung front splitter promise to work in concert with a functional rear diffuser, fed by a ducted and contoured underbody surface – once again, think Ferrari. Every vent is functional, either feeding or exhausting hot air from the radiator, front brakes, engine oil cooler, transmission cooler or rear limited-slip differential. The interior promises to be first rate with customized Recaro sport buckets, high-grip materials (think alcantara), aluminum appointments and non-glare dash elements. Will it measure up to the lush ambience of a Porsche or Ferrari? No, most certainly not. Will it feel special and give the driver a proper cockpit? Yes – and it may have entered the same universe as BMW’s M4 interior – not likely as luxurious or premium, but at least competing on the same planet, maybe even the same continent. I’m perplexed why Ford didn’t build an all-aluminum Ford Mustang, instead choosing to build an all-aluminium pickup truck (the new Ford F-150). Nobody cares about lightening up a pickup – in fact for towing and snow-plowing, most owners want a heavier truck. Nonetheless, Ford invested millions in an all-aluminum body pickup – shaving 700 pounds off the curb weight(!) – while leaving the body of the Mustang GT in steel. Yes, it’s about fuel economy – but it’s disappointing that Ford didn’t give its new Mustang the same light-weight treatment as its best-selling pickup. The GT350 promises a partial aluminum body, but we can’t help but ponder just how light Ford could’ve gone had the base Mustang been a svelte 3,500 lbs to begin with (the new Mustang GT actually gained 87 lbs over its predecessor). On another note, I’m a little concerned about the production GT350’s engine sound. It could sound an awful lot like a V8 Ferrari, given the engine’s similar flat-plane crankshaft architecture and lofty redline, but I’m slightly concerned Ford might get it wrong. In the below video showing prototypes on the ‘Ring, the engine sound leaves my ears straining to hear the high-rpm fervor. It sounds closer to a large-displancement Mercedes-Benz AMG V8 – which isn’t entirely a bad thing, but I crave the metallic music hailing from Italy. Like every other journalist, I’m hesitant to pass judgment before driving the car on road and track – but all signs point toward awesome. Before the new Toyota GT86 (known in North American markets as the Scion FR-S) launched, I analyzed the data and arrived at a similar level of giddy anticipation – and as it turns out, my projections were vindicated when the car finally launched (see here) – the GT86/FR-S is a smashing success, hailed as one of the world’s best driving cars in equal chorus by the world’s automotive journalism core. It appears that Ford have perfected the GT350 such that it will leave little to be desired, and like a few other aforementioned exceptional cars, its shortcomings will be easily overlooked in light of its brilliant strengths and exotic persona. I’m going to go out on a limb and predict that the GT350 will be hailed as one of the best new performance cars of 2015, able to take the fight to the Europeans. What about the inevitable badge snobbery? To those who would dismiss Ford’s racing credentials, perhaps it’s time you let the Ford GT40’s crushing defeat of Ferrari at LeMans sink in. Or the victories Ford has claimed at the Daytona 500, Indianapolis 500, Grand Prix of Monaco, Baja 1000 and WRC World Rally Championship percolate in your gray matter. Then there’s the global Formula Ford open-wheel racing series. Okay, the bulk of Ford’s cars remain mainstream and utilitarian, but it’s clear that when Ford’s best get behind a project, it can indeed be the best, or at minimum compete valiantly on the world stage. The Ford badge doesn’t hail from Europe, but Ford’s global product line is now heavily influenced and developed by its European division. The GT350 has spent quality time lapping the Nurburgring with lofty European sports car targets in its cross hairs – and that should bode well for the final production car. If you’ve got a hankering for an even more extreme, lightweight Mustang, you’ll have to wait for the GT350R to launch at the upcoming Detroit Auto Show (It will be to the GT350 what the Boss 302 Laguna Seca was to the regular Boss 302 Mustang of the last generation). Rumor has it the GT350R will delete the rear seats and exchange more steel for aluminum and carbon-fiber, thus lightening the car closer to the weight of an M4, or possibly even less. Power will be increased, and the suspension will likely be further dialed-in for track use, as will the brakes (carbon ceramic?) and wheel & tire package. Who will cross-shop a GT350 with an M4? Historically, few M3 buyers thought of the Mustang and visa versa when shopping for their new performance car – but the Boss 302 Laguna Seca started to change that. Ford directly attacked the M3 and openly bragged that its finely-tuned Boss 302 was quicker around Laguna Seca – the marketing team was so proud of this achievement they added “Laguna Seca” to the nomenclature. Ford’s high-rev flat-plane V8 is sure to be a gem of a powerplant. It subscribes to BMW’s former high-rev engine philosophy in M cars of generations past. I’m not the only BMW aficionado who misses the wailing 8,400 rpm redline of the E92 M3, or the 8,250 rpm scream of the E60 M5’s V10 – thousands of BMW fans miss the high-rev character of previous M engines. The GT350 may have more E46 M3 character in it than the M4 does, and this could swing some M4 shoppers to the dark blue side. Ford want you to cross-shop the Mustang before you buy an M4 – but it remains to be seen how discerning performance drivers and BMW owners will react to the GT350 once it launches. The step on in technology, style and performance certainly won’t hurt Ford’s cause – particularly when you factor in a price tag that will likely undercut the M4 by at least ten thousand George Washingtons. The MSRP of the new GT350 was supposedly leaked at the LA Auto Show – those standing by the grape vine heard $52,995 USD in the US market. The GT350R due to launch in Detroit is rumored to call for around $70,000 for all its track-ready tech, and costly weight-reducing materials. Stay tuned for a track and road review of the new GT350 once it launches. Only after pitting it directly against the M4 can we draw clear conclusions. In the meantime, check out the GT350 completing development laps on the ‘Ring.